When deleting Photo Library from iPhone, like iPhone 4, you may feel frustrated, for iPhone only enables you to directly remove the photos in Camera Roll one by one, not those in the Photo Library. Therefore, if the photos in the Photo Library possess a large space and you want to delete them, you have to remove the original photo folder on your computer before syncing with iTunes. However, what if you don’t want to delete the original folder on your computer when removing photos on iPhone? In fact, it’s not difficult to delete Photo Library from iPhone without removing photo folder on your computer. All you need is to download a third-party tool – Wondershare MobileGo for iOS or Wonderhsre MobileGo for iOS (Mac). It’s a powerful and useful program. 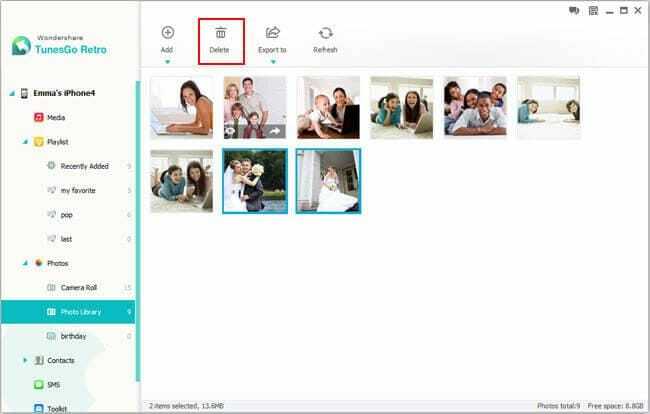 With the help of it , you are able to delete massive photos in the Photo Library with only 3 clicks . In addition, it doesn’t have any impact on your photo folder on compute. Thus, just feel free to remove iPhone Photo Library! In the following part, we’re going to explain how to do it step by step on a Windows computer. If you use a Mac, you can still go through the steps, because the steps in the Windows version are similar to those in Mac version. Download this program on your computer and follow us. To get started, install MobileGo for iOS on your computer and then launch it. Connect your iPhone to your computer via a USB cable. This program will detect it immediately as soon as it’s connected. 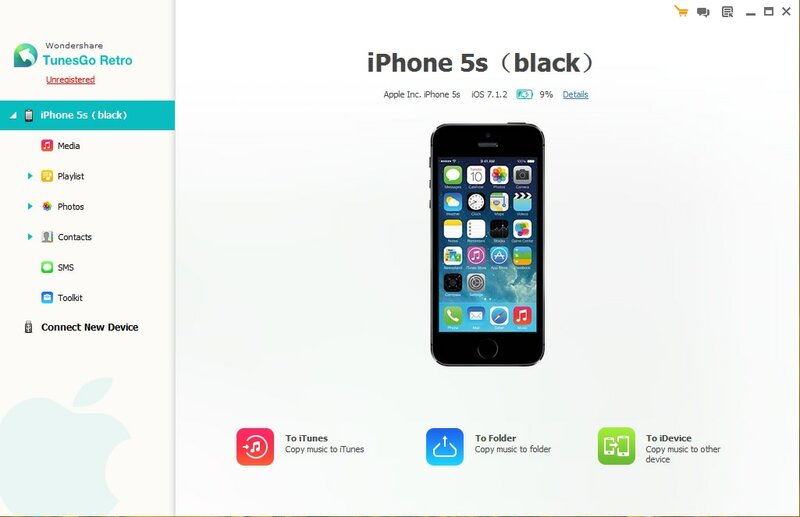 Then, your iPhone will be displayed on the main interface. Note: Before using MobileGo for iOS, you ought to install iTunes on your computer. This program supports iTunes 11. 1. Click "Photos" in the left directory tree to bring up the photo window. 2. Click "Photo Library" to open this album. 3. You can either click "Ctrl + A" to select all photos or select partial photos. 4. Click "Delete" to begin to delete Photo Library on iPhone. During the process, please make sure that your iPhone is connected all the time. Note: MobileGo for iOS is fully compatible with iPhone 5, iPhone 4S, iPhone 4 and iPhone 3GS. It takes you a few seconds to delete unwanted photos in your Photo Library. Then you find that you have managed to delete Photo Library on your iPhone. This solution is really very easy and useful, isn’t it? Apart from deleting Photo Library from iPhone, you are capable of importing your favorite photos to Photo Library as well as exporting photos to your computer.